Are you planning a golf trip or heading home from one? Avoid the hassle of lugging your clubs through the airport. Instead, let Pak Mail ship your golf clubs from Palm Beach Gardens and have them waiting for you at your destination – the golf course, your hotel, or friend or family's home or business. 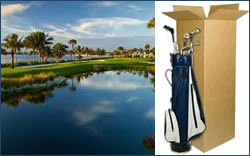 We can pick up your clubs at your home or golf course in Palm Beach Gardens, and pack and ship them. We can even provide a return shipping label to ship them back from Palm Beach Gardens when you're headed home. Contact us for details.